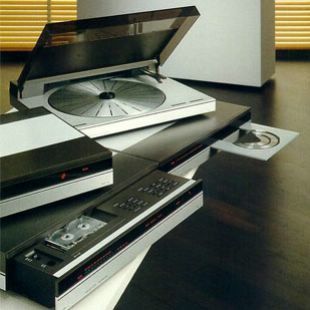 If you wanted to treasure your record collection, you couldn't do it better than with Beogram 5500. The electronically-controlled tangential arm played the record at the exact angle that the original master was cut. This allowed the ultra-sensitive MMC 4 pick-up to give the most precise possible reading of the signals in the groove. And with a stylus pressure of only 1,2g, this extraordinarily gentle touch added years to the life of your precious records. Beogram 5500 was a tough customer though; dancing feet wouldn't shake it up, courtesy of the special chassis suspension and short, rigid tone arm. You also could enjoy features such as the automatic registration of record size and speed; plus full track search and record repeat facilities, via the Master Control Panel. Beogram 5500 was aesthetically balanced to match the rest of the components within Beosystem 5500 and could be controlled with the rest of the system through Master Control Panel 5500. The 5500 was essentially exactly the same as the 5005 but re-badged to match the Beosystem 5500. As befitted what was regarded at this time as the midrange system, it sported an MMC4 cartridge.